All pets are required to have a preoperative blood screen prior to surgery. Although it is optional, we also recommend a preoperative chest x-ray and ECG to assess heart function. All of our patients are monitored during surgery by our skilled technicians and surgeons. We use state-of-the art anesthesia monitoring equipment to monitor pulse oximetry, blood pressure, ECG, heart and respiratory rate and temperature. All anesthesia protocols are tailored to the needs of each individual pet based on procedure, age and risk. We also use a multimodal approach for all anesthetic procedures; this refers to the practice of combining multiple drugs and/or methods. This method allows us to give drugs at lower doses which increases safety and provides a more predictable anesthetic plane during the procedure. As needed we administer a pain management regimen before, during and after your pet's surgical procedure. 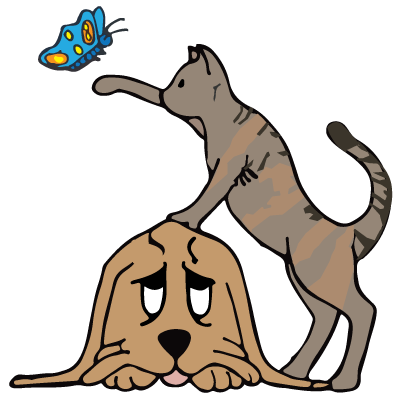 All pain management regimens are tailored to the individual needs of your pet. When is TTA surgery needed? The ligament located closest to the front of the knee joint is known as the Cranial Cruciate Ligament (CCL). These ligaments, in stabilizing the knee, aid in preventing the femur and tibia from moving back and forth across each other. When the CCL is torn the knee becomes unstable. Dogs that rupture their CCL can appear suddenly lame. A CCL tear can most successfully be managed with surgery. While we usually recommend TTA surgery there are several surgical options available to repair a ruptured CCL and we encourage you to explore all of them. We are also happy to refer you to a boarded orthopedic specialist. In the typical joint, the angle formed between the tibial plateau and the patellar tendon is about 115 degrees when the leg is in the normal standing position. The abnormal motion that occurs in the knee when the CCL is torn is called tibial thrust. In the TTA procedure a wedge osteotomy is performed changing the standing angle to 90 degrees. The osteotomy is stabilized with a combination of titanium parts. This alteration subsequently neutralizes the instability resulting from the torn CCL. Who performs the TTA procedure? Dr. Barnes performs TTA repairs here at the hospital. He received specialized training in the Tibial Tuberosity Advancement Technique (TTA) for the surgical management of cranial cruciate ligament injuries in dogs. His initial TTA surgical training was in 2007; Dr. Barnes chose to pursue additional training in 2011, 2014 and 2017. He has been performing TTA surgeries successfully since the spring of 2008. The above is a general synopsis regarding CCL repair and is meant for informational purpose only. If your dog needs a CCL repair please call us at 603-329-6553 to set up a consultation.